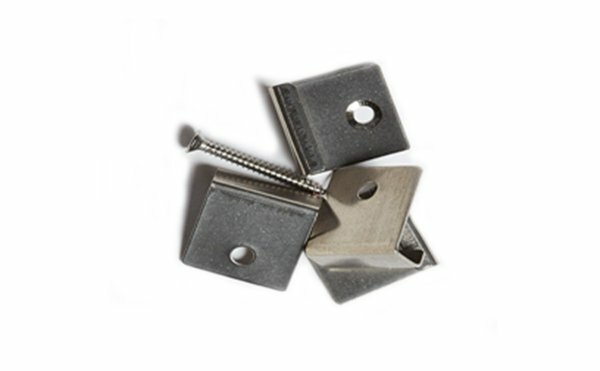 INVISI-CLIP is DECKERS hidden clip fixing system for DECKER Decking. DECKER’s installation system for decks is easy, quick and hidden. Our clips are fixed directly to the joists. Our boards are held in place through the clip which fits into the edge channel. This means there is no screwing directly into the decking boards and the clip system allows for slight expansion and contraction with temperature variations. Our Invisi-Clip system is the same for both DECKER Design and DECKER Protect decking boards. There are two choices of clip type, either stainless steel or plastic. We slightly prefer the plastic Invisi-Clip because it is fixed with a single screw which can be fixed through the gap between the decking boards (roughly 5mm). This has advantages if you ever want to lift just one board at a later date. However, both clip types are great for easy installation of DECKER decking. We recommend using 20 clips per square metre, and sell the clips with composite decking wood screws in packs of 100, or boxes of 500. Please note that the standard screws are not useable with metal joists. We have a number of alternatives for aluminium or steel joists so let us know when you enquire and we can suggest the best option. Starter Clips are used for the first and last boards, where there is only one channel for fixing. We provide these in packs of 10 because you don’t need many for a deck.